The painting “Early Spring” belongs to the famous Russian painter Arkhip Ivanovich Kuindzhi. The canvas was written in 1895, it belongs to the best landscapes of the artist. The central place in the picture is reserved for the river ice-bound, frozen on the eve of the spring flood in anticipation of the first warm rays that could allow it to release all its power and show itself in all its glory. The ice on the river cracked, the first water is already beginning to appear through it, spring is coming. She is eagerly awaited by green grass, bare branches of trees and a blue sky. A premonition of spring is what makes this picture so attractive and beautiful. Every day brings spring closer, the first buds have already appeared on the trees depicted by the artist on the left side of the picture. Very soon they will become leaves, and then no frost will be terrible for them. 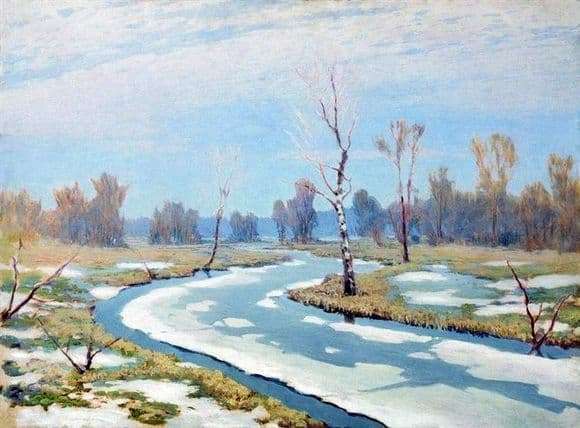 Winter will not be able to stop the onset of spring, this is indicated by the entire composition of the painting, built by the painter in such a way that it would seem as if the river goes into infinity and ends somewhere in the fog that wraps the forest in the background. The canvas is different color and light saturation, everyone looking at him understands that this is not just a picture, but a hymn to the oncoming heat, sunlight, green riot of forests and fields. Such a landscape can contemplate anyone who at least once in his life chosen in the early spring to nature. And yet there is in it something special – easy and unique, something that does not understand and does not catch the eye of an ordinary person, but that easily captures and displays in the picture the experienced hand of the painter. The picture was painted in the spirit of realism, for which canvas and oil paints were used. At this time, the canvas belongs to the cultural heritage of the Ukrainian people and is stored in the Kharkov Museum of Art.